Even while "The Wheel in Space" - the next Cyber serial following the runaway success of "The Tomb of the Cybermen" - was still being written, Kit Pedler was being asked for another storyline to produce down the track, to keep the big silver guys firmly in the audience's minds. "Return of the Cybermen" was to be just another adventure, but a series of fortunate chances made it into something more: the episode planned to follow it ran into trouble in the writing stage, so "Return" was boosted to eight episodes (the longest serial since "The Daleks' Master Plan"), producer Peter Bryant suggested bringing back that Colonel Lethbridge-Stewart character from "The Web of Fear," which evolved into the creation of the United Nations Intelligence Taskforce - U.N.I.T. - and then, since the military was being portrayed in a positive light (helping save the Earth and all) the Ministry of Defence offered the use of an airbase, various vehicles (including a Hercules transport, serving as UNIT's mobile headquarters), equipment, and a small army of troops to use as extras. "The Invasion," as it became known (to keep the Cybermen's involvement a surprise), wound up being the Doctor Who equivalent of a summer blockbuster. "What is it? What's happening?" "It's the Cybermen - we've just seen hundreds coming out of the sewers!" While there may not have been hundreds of them, Londoners also got treated to the sight of Cybermen emerging in the midst of the capital - which unfortunately proved something of a problem for the show's staff, who had no experience dealing with those kinds of crowds on location shooting. 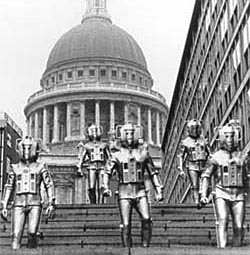 Delays wound up costing the show several planned scenes at major landmarks, but luckily the sequence of the Cyber army marching in front of Saint Paul's Cathedral was secured, and went on to become the serial's iconic image. While everyone was happy with the way the Cybermen had looked in previous stories, the costume modifications done for "The Wheel in Space" had proven a real bugger to work with - especially the spindly new exoskeletons, which tended to fall off all over the place, such that the only way to get through a single scene by the later episodes was to have the Cybermen remain as motionless as possible. Bobi Bartlett, the show's costume designer at the time, decided that since the serial would require more costumes than were already available anyway, they may as well just go all-out and make new ones. One improvement - from a budgetary standpoint - that "Wheel" had managed was to discard the costume-department-made one-piece suits in favour of commercially-available wetsuits, with the old helmets and chest units attached; and the new model (classed Cyberfaction by David Banks's book) had all-new heads and chestpacks, but copied the wetsuit idea, since they were much easier and cheaper to get in bulk. Given a spray of the ubiquitous silver, the suits were then fitted with segmented rods "powering" their limbs. As with the Cybertelosian, this figure has to be a bit clever in interpreting those limb rods, lest it immobilize itself. In this case, the upper and lower rods are entirely separate - turning the limbs at the knee or elbow brings the lower rod along for the ride, but with no connecting point there's no stress on the joint. The gaps are visible, but only if you look closely - with all that silver reflecting for all it's worth, they're quite difficult to spot. 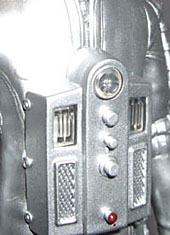 The wetsuits are sculpted in all their detail - including such features as the zipper up the front, which the costume department probably wished they'd had time to get rid of - and, impressively, the slight deformations caused by the anchor points where the chest unit is attached; the unit itself gets the usual paint and clear-piece decoration. The most endearingly dorky aspect of the costume - as it would be in several subsequent Cybermen as well - is preserved, the visible laces on their feet, which are simply lace-up boots sprayed silver. Bartlett also redesigned the Cyber heads for the occasion, adding to them the distinctive "earmuffs" that would survive through all subsequent redesigns until the new show (and even then, the new Cyber-helmets have smaller echoes of the design at the sides). The new face does away with the silver lining of the eyes and mouth, and the mouth itself is much thinner. The eyes also sport the "tear drops" that have survived to the present (first introduced in "Wheel," where there was one below the mouth as well), and the sculpt manages even to reproduce the texture of the silver mesh inside the sockets, through which the actors saw (though not very well). With the helmet's neck hidden inside the collar of the wetsuit, the figure is able to turn its head about 15 or 20 degrees either way - not much, but it helps. Elsewhere the articulation is normal for the Doctor Who line, except that the exoskeleton has necessitated the absence of bicep swivels, as well as the thigh swivels most of these Cyber figures have skipped. Everything else is intact: swivel shoulders, pin elbows, swivel wrists, swivel waist, swivel/pin hips, pin knees, and swivel ankles. The backward swing of the legs is limited, but it's possible to get a decent slow-march pose out of them. Since they were up against a real military this time, rather than a bunch of unsuspecting scientists or archaeologists or whatever, the Cyber forces got some heavy hardware in place of their old light weaponry and ad-hoc lighting-shooting hands. At least three distinct styles of Cyber gun were produced; the figure comes with the most common of them, a short rifle-sized sci-fi gadget with a curved stock. The figure isn't able to get the stock against its arm, but it looks fine held one-handed - the right hand is moulded specifically for the handle. Cyberfaction also gets the legs of the "Tomb" Cyber Controller as its BAF bit - which, along with the doubling up on other figures, makes me wonder if a larger Cyber-figure series was planned, then scaled back (if so, I hope the other models see the light of day eventually). The legs are very similar to the "Tomb"-era Cyberman, except that its trousers aren't tucked into its wellies. "The Invasion," besides being a hit itself, did a lot to set the stage for the subsequent Jon Pertwee era - present-day, Earth under threat from aliens, UNIT helping the Doctor and all that. Unfortunately, that was the Cybermen's undoing for quite some time. Having already invaded the Earth and taken on UNIT, no one could really think of a way to bring them back without repeating themselves, and with the cycle of one-every-season stories broken, it wasn't until Tom Baker's "Revenge of the Cybermen," almost eight years later, that they showed their metal faces again as more than a brief stock-footage cameo. Regardless, "The Invasion" was the height of the Cybermen's fame, and this is a strong figure to commemorate it.